Two brightly colored pink and yellow Hawaiian Sunrise Shells drape from a cascade of tiny North Shore Ke Iki Beach Seashells of all colors, fossilized Sharks Teeth and Gemstones woven on sterling! The large Sunrise Shells are beauties with bold luster and color, and are over 1 1/8 inch in size. You'll surely get noticed in these shells!! 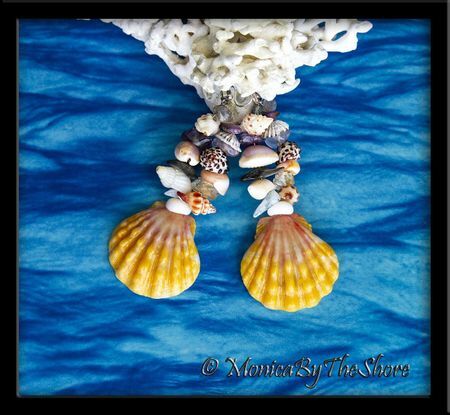 Unique, natural beach jewelry hand crafted with the finest shells in Hawaii, and sure to bless you with many sincere compliments. 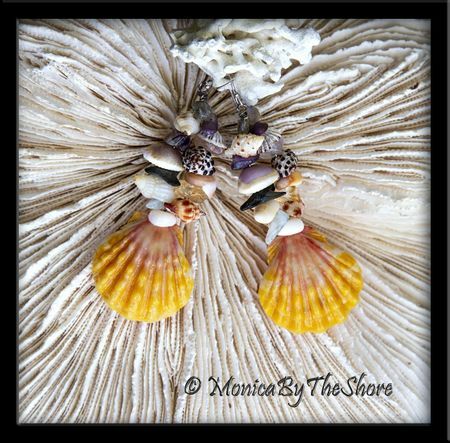 Original one of a kind Sunrise Shell jewelry designs by MonicaByTheShore of Haleiwa, on the North Shore of Oahu, and Honolulu Hawaii.